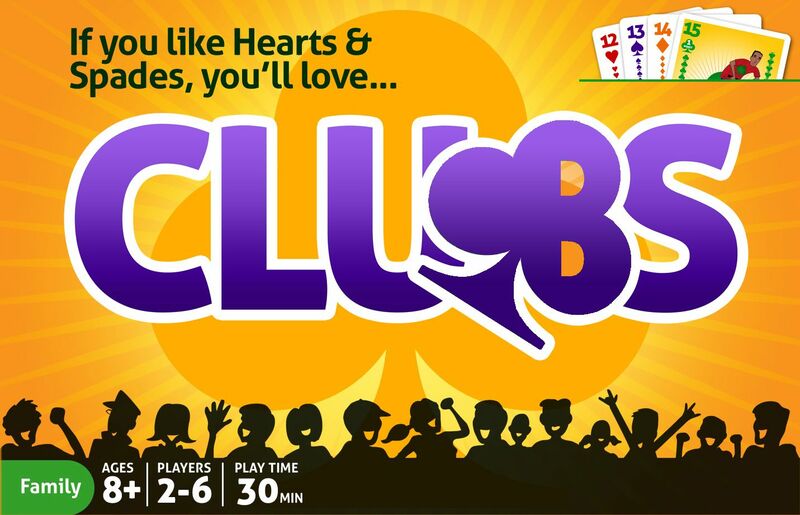 First there was Hearts, then there was Spades, and now North Star Games is bringing you Clubs. The suit of clubs finally gets some respect! Play all your cards as quickly as possible each round. Win tricks with clubs in them. To play a round, deal out 10 cards to each player. Players may call Double or Nothing anytime before playing their first card. The player to the left of the dealer leads with a Trick-Type. Legal Trick-Types include any singleton, pair, 3-of-a-kind, 4-of-a-kind, or any run of 2 or more cards. Players can either pass or follow with a similar hand of higher rank. When all of the players have passed consecutively, the pile is taken by the person who played last. That player leads with a Trick-Type of their choice. The last player out for the round does not get bonus points and does not receive points for any clubs he may have taken. The points for clubs varies from 5 points (for the 1 of clubs) to 1 point (for the 10-15 of clubs). The first player to 50 points wins the game.